The Aerial Camera Platform is a stabilized camera gimbal levitated via balloon, which provides high quality aerial imagery of the surrounding environment and a high point of view for monitoring applications. Applications include performing real-time wildlife surveys, creating high resolution aerial panoramics, and creating 3D reconstructions of objects or areas. The Aerial Camera Platform was designed to take aerial panoramic photos and orthophotos. Below are two aerial panoramics created by the Aerial Camera Platform. One application of the Aerial Camera Platform is the creation of 3D reconstructions from aerial photos using a technique called Structure from Motion. This technique uses overlapping photos of an object or scene to create a 3D rendering of that scene. This is especially useful in applications such as habitat monitoring, where a 3D rendering provides detailed information about a habitat that is lost in 2D photos. We have used the Aerial Camera Platform to create 3D models of various structures and environments, such as an art installation from the Stuart Art Collection seen below. We have also used the platform to create 3D models of archaeological excavations, notably the excavation of the famed racehorse Native Diver in March 2014. The remains of Native Diver, which had lain at Hollywood Park Racetrack in Inglewood, CA for several decades, were excavated by USC Archaeology and moved to the Del Mar Racetrack after the closure of Hollywood Park. We were on-site to create a 3D model and aerial timelapse of the excavation using our aerial camera system. Another application of the camera platform is to monitor wildlife and their habitats. The high point of view afforded by the aerial platform makes it an ideal solution for spotting wildlife from the air at great distances. Additionally, the platform can be used to create orthophotos to monitor the decline or recovery of wildlife habitats. In partnership with the San Dieguito River Valley Conservancy, we have used this platform to monitor the recovery of native plants in the San Dieguito Watershed, where invasive plant species were removed. We created an orthophoto of the area so that conservationists can monitor the growth or decline of native plants in the area after the removal of invasives. 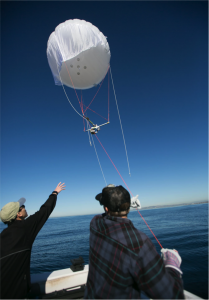 We have also used the Aerial Camera Platform to monitor marine wildlife, specifically the gray whale population off the coast of Southern California. The aerial perspective afforded by the camera platform makes it easier to see marine wildlife from a distant vantage point, aiding in population counts and surveys.